After a long summer and a lot of planning " A Garden on the Bay" Garden project will soon break ground! Deering Bay Yacht and Country Club has teamed up with Temple Beth Am's 4th graders to plant an garden. The garden will be ready for planting in mid-November. As we continue to creatively try to enhance the Deering Bay Dining room experience, we hope to raise the bar and provide a unique dining experience for our members by growing our own vegetables, herbs and edible flowers that will be incorporated into our evening dining room specials. The garden vegetables will include: Fennel, Cherry Tomatoes, Golden Beets, Escarole, Bok Choy, Arugula, French Breakfast Radishes, and Carrots. We'll also feature 5 types of herbs and 4 different kinds of edible flowers. The "Garden on the Bay" project includes my personal favorite activity: the propagation of pineapples. Pineapple propagation is a neat aspect to this project because it combines history, growing, recycling and ecology. After a lengthy web search, I discovered that the pineapple industry flourished in South Florida and the Upper Keys and even on land now considered part of Deering Bay. Its very possible that your South Florida home was once a field of pineapples, avocado or mango trees. Our next door neighbor, the US Department of Agriculture's Subtropical Horticulture Research Station was even part of the early avocado, mango and pineapple introductions in the 1910s. One article describes a 200+ acre plantation in the Little River area of Miami-Dade as well as large farms in Plantation Key, Del Ray and Key Biscayne. The land boom and the railroad economy forced the pineapple industry overseas, most notably to Hawaii and the Philippines. Today, growers ship or fly tons of pineapples to the United States and truck them across the country. This creates an obscene carbon footprint. Two years ago, I began recycling pineapple tops from the Deering Bay kitchen and growing them on my farm with good results. This November we will include pineapples in our "A Garden on the Bay" project using those very recycled tops. The fruit ripens from bottom to top, be careful in some cases ants will come up from below and eat holes in the fruit ..when it turns a golden color its ready to pick! Tim, Tess: This is terrific! How did it taste? On a side note, Pineapples were also grown commercially in the area around Boca Raton. It was huge. I know that some Japanese growers were brought in to help. 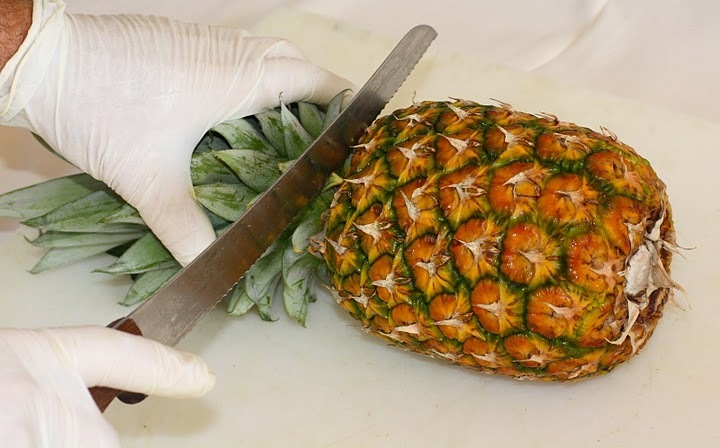 Tim, is this the way that Pineapples are propagated commercially? The taste of a 'just picked' sugar sweet, sun warmed, ripe, golden pineapple is heavenly. Planting, growing & harvesting your own garden is delicious, healthy and personally rewarding. You learn to appreciate nature's beauty, bounty and challenges.